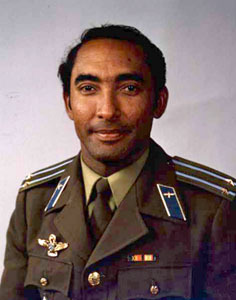 Guion Bluford was the first African American in space, but the first person of African American ancestry in space was the Cuban Cosmonaut Arnaldo Tamayo Méndez. 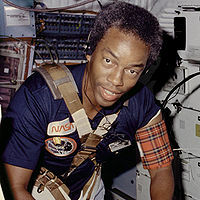 The first black American astronaut, Guion S. Bluford, into space as a mission specialist. Bluford left NASA in July 1993 to take the post of Vice President/General Manager, Engineering Services Division of NYMA, Greenbelt, Maryland. 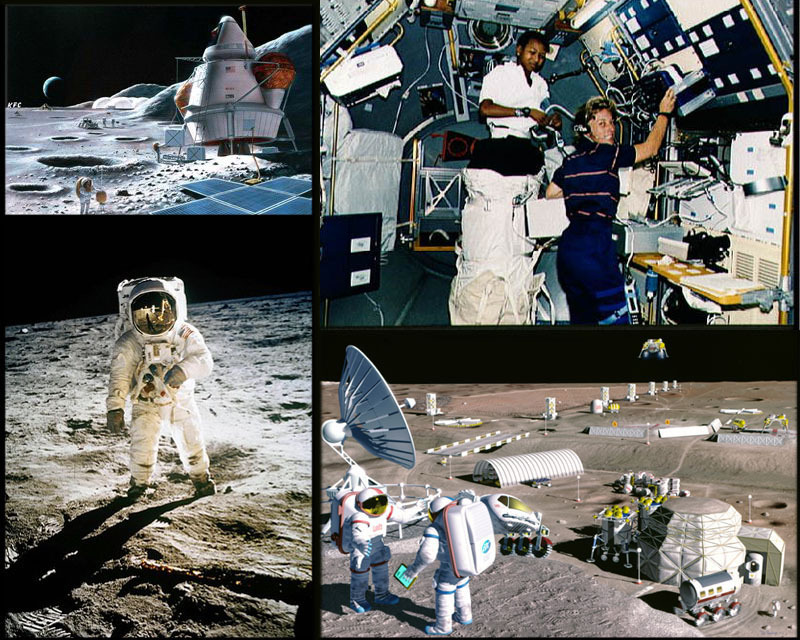 In May, 1997, he became Vice President of the Aerospace Sector of Federal Data Corporation and in October, 2000, became the Vice President of Microgravity R&D and Operations for the Northrop Grumman Corporation. He retired from Northrop Grumman in September, 2002 to become the President of the Aerospace Technology, an engineering consulting organization in Cleveland, Ohio. He was inducted into the International Space Hall of Fame in 1997. Dr. Mae Jemison was the science mission specialist on STS-47 Spacelab-J (September 12-20, 1992). STS-47 was a cooperative mission between the United States and Japan. The eight-day mission was accomplished in 127 orbits of the Earth, and included 44 Japanese and U.S. life science and materials processing experiments. 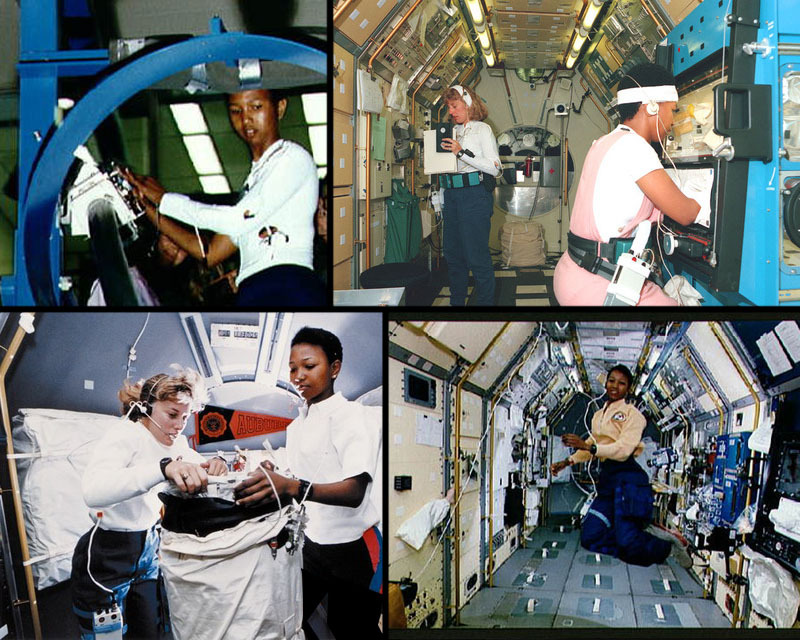 Dr. Mae Jemison was a co-investigator on the bone cell research experiment flown on the mission. The Endeavour and her crew launched from and returned to the Kennedy Space Center in Florida. In completing her first space flight, Dr. Mae Jemison logged 190 hours, 30 minutes, 23 seconds in space, making her the first African-American woman in space. Chemical engineer, scientist, physician, teacher and astronaut, Dr. Mae Jemison has a wide range of experience in technology, engineering, and medical research. In addition to her extensive background in science, she is well-versed in African and African-American Studies, speaks fluent Russian, Japanese, and Swahili, as well as English and is trained in dance and choreography. On October 17, 1956, the city of Decatur, AL saw the birth of a remarkable woman, Mae Jemison. The youngest of three children born to Charlie Jemison, a maintenance worker and his wife, Dorothy, a teacher, Mae moved with her family to Chicago at the age of three. 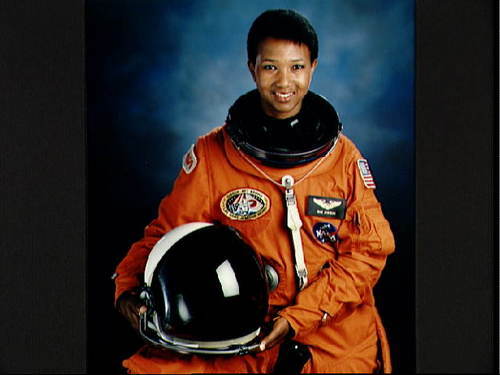 After graduating from Morgan Park High School in 1973 at the age of 16, Dr. Mae Jemison earned a BS in Chemical Engineering from Stanford University, while also fulfilling the requirements for a BA in African-American Studies. After earning these degrees in 1977, she attended Cornell University and received a Doctor of Medicine degree in 1981. During medical school she traveled to Cuba, Kenya and Thailand, providing primary medical care to people living there. Demonstrating her compassion, Dr. Mae Jemison served in the Peace Corps, from January 1983 to June 1985. She shared her abilities in Sierra Leone and Liberia, West Africa as the area Peace Corps medical officer. Among her duties, she supervised the pharmacy, laboratory, medical staff as well as provided medical care, wrote self-care manuals, developed and implemented guidelines for health and safety issues. Also working in conjunction with the Center for Disease Control (CDC) she helped with research for various vaccines. Upon completion of her Peace Corps duties, Dr. Mae Jemison returned to the US, accepting a position with the CIGNA Health Plans of California as a general practitioner in Los Angeles, California. Having a desire to do more with her life, she enrolled in graduate classes in engineering and applied to NASA for admission to the astronaut program. She was turned down on her first application, but persevered and in 1987 was accepted on her second application. She became one of the fifteen candidates accepted from over 2,000 applicants. When Dr. Mae Jemison successfully completed her astronaut training program in August 1988, she became the fifth black astronaut and the first black female astronaut in NASA history. 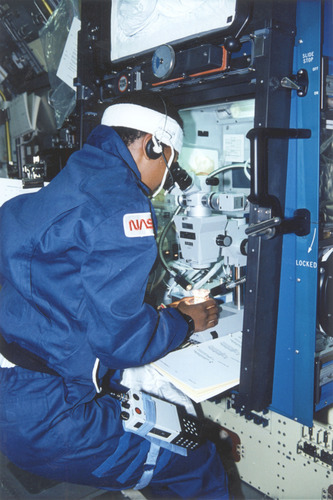 Her technical assignments included: launch support activities at the Kennedy Space Center in Florida; verification of Shuttle computer software in the Shuttle Avionics Integration Laboratory (SAIL), Science Support Group activities. In 1993, Dr. Mae Jemison resigned from NASA and founded the Jemison Group, Inc. to research, develop and implement advanced technologies suited to the social, political, cultural and economic context of the individual, especially for the developing world. Current projects include: Alpha, (TM) a satellite based telecommunication system to improve health care in West Africa; and The Earth We Share, (TM) an international science camp for students ages 12 to 16, that utilizes an experiential curriculum. Among her current projects are several that focus on improving healthcare in Africa. she is also a professor of environmental studies at Dartmouth College. Dr. Mae Jemison is the host and a technical consultant to "World of Wonders" series produced by GRB Entertainment and seen weekly on the Discovery Channel. She feels very honored by the establishment (1992) of the MAE C. JEMISON ACADEMY, an alternative public school in Detroit. Awards and honors she has received include Essence Award (1988), Gamma Sigma Gamma Women of the Year (1989), Honorary Doctorate of Science, Lincoln College, PA (1991), Honorary Doctor of Letters, Winston-Salem, NC (1991), McCall's 10 Outstanding Women for the 90's (1991), Pumpkin Magazine's (a Japanese Monthly) One of the Women for the Coming New Century (1991), Johnson Publications Black Achievement Trailblazers Award (1992), Mae C. Jemison Science and Space Museum, Wright Jr. College, Chicago, (dedicated 1992), Ebony's 50 Most Influential women (1993), Turner Trumpet Award (1993), and Montgomery Fellow, Dartmouth (1993), Kilby Science Award (1993), Induction into the National Women's Hall of Fame (1993), People magazine's 1993 "50 Most Beautiful People in the World"; CORE Outstanding Achievement Award; National Medical Association Hall of Fame. Dr. Mae Jemison is a member of the Association for the Advancement of Science; Association of Space Explorers: Honorary member of Alpha Kappa Alpha Sorority, Inc.; board of Directors of Scholastic, Inc.; Board of Directors of Houston's UNICEF; Board of Trustees Spelman College; Board of Directors Aspen Institute; board of Directors Keystone Center; and the National Research Council Space Station Review Committee. She has presented at the UN and internationally on the uses of space technology, was the subject of a PBS Documentary, THE NEW EXPLORERS; ENDEAVOUR by Kurtis Production and appeared in an episode of STAR TREK: THE NEXT GENERATION. She resides in Houston Texas.